Mary Sue Kries, age 92, widow to James Kries, passed away Saturday, December 1, 2018 in Lexington, Kentucky. She was born January 26, 1926 in Henderson County Kentucky to the late Robert and Garnett Woosley Bennett. Mary was a member of First United Methodist Church in Georgetown, she was a former telephone operator and retired from First National Bank. 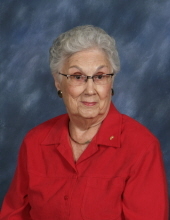 She was a member of the Morning Glories Homemakers in Scott County, she loved to travel and going on trips. Mary is survived by her sons, Scott Kries of Georgetown, Kentucky and Stephen (Frances) Kries of Lexington, two grandchildren, James David Kries and Calab Scott Kries. She is also survived by her brothers, Robert (Virginia) Bennett and Harry (Sug) Bennett, both of Zion, Kentucky, and sisters, Mildred Connaway of Henderson, Kentucky and Martha (Bobby) Cline of Bowling Green, Kentucky. She was preceded in death by her brother Paul Bennett. Visitation for friends will be 9 to 12, Thursday, December 6, 2018 at Tucker, Yocum & Wilson Funeral Home with funeral service at 12 noon with Rev. Greg Gallaher officiating with burial to follow. Online condolences may be expressed to the family at www.tuckeryoucmwilson.com. To send flowers or a remembrance gift to the family of Mary Sue Kries, please visit our Tribute Store. "Email Address" would like to share the life celebration of Mary Sue Kries. Click on the "link" to go to share a favorite memory or leave a condolence message for the family.